For fans of Ramin Bahrani movies, At Any Price is source of both jubilation and frustration. Finally, after toiling in relative obscurity and making small, character-driven films with mostly unknown actors, this talented, young filmmaker gets a chance to stretch his legs. How odd it is, then, that he fumbles the ball. Though At Any Price features a few great performances and images of the American Midwest that would make even Terrence Malick weak in the knees, it’s a curiously jumbled effort that exhibits none of the thematic precision so apparent in the director’s previous features. The film follows various members of southwestern Iowa’s Whipple family. 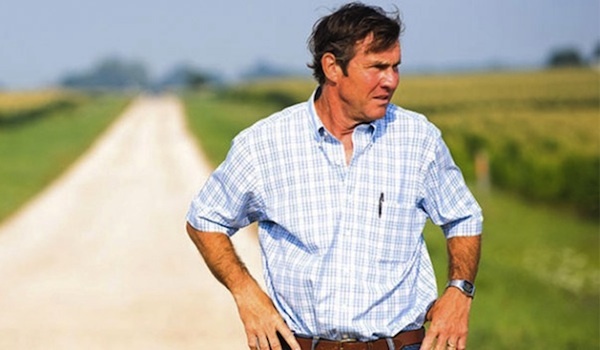 Henry (Dennis Quaid) is a third-generation corn farmer. He’s the king of seven Iowan counties—err, make that six. His biggest competitor, Jim Johnson (Clancy Brown), has just nabbed Decatur. Nevertheless, Henry will bounce back. He’s a hard worker who doesn’t take shortcuts—err, actually he’s illegally reusing genetically modified seeds, and investigators are breathing down his neck. At least he has his family in his corner. His wife, Irene (Kim Dickens), is an ideal partner on both the business and emotional ends of life—err, well he’s cheating on her with the much younger Meredith (Heather Graham). His sons, though, are the pride and joy of his life. Dean (Zac Efron) and Grant (Patrick W. Stevens) are poised to become fourth-generation Whipple farmers—err, actually Dean hates his father and wants to race cars professionally, while Grant, after leaving town on an Iowa State football scholarship, is traveling Argentina, far from eager to come home. Yes, Henry’s life is falling apart. 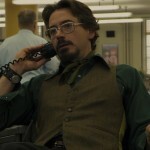 His folksiness is merely a facade that gets torn away near the film’s midpoint as his problems become unavoidable. The character is fascinating, and Quaid’s performance is the film’s biggest asset. He’s an inherently unlikable individual; we first meet him at a funeral trying to swindle the deceased’s family out of some land. He’s an overly pushy father and an unfaithful husband, and he has a terribly grating personality. It’s hard, however, not to admire someone so earnest. Ultimately, Henry’s intentions are pure, and while he acts out in a lot of borderline unforgivable ways, he’s a good person who’s trying. Because Dean and Grant (who never actually appears in the film except for pictures and letters) aren’t there for Henry, he forges a relationship with Cadence (Maika Monroe), Dean’s girlfriend who has neither direction in life nor a father figure. She shadows him while he conducts business and proves her acumen on more than one occasion. This relationship is the antithesis of the one between Henry and Dean (more about that below) on a number of levels. The “love” they share isn’t one of obligation, but rather admiration and common interest. Not only that, but unlike the Dean-Henry material, the scenes Henry and Cadence share actually work. The story, however, is Dean’s as much as it is Henry’s, and in that respect, it’s a failure. Dean is a baby—an utterly uncompelling individual who wears a massive chip on his shoulder for no discernible reason. He treats those around him like garbage—completely disposable. And worst of all, Bahrani doesn’t seem to know how we’re supposed to feel about the young man. He never passes judgment on Dean, but there aren’t any redeeming qualities there. Zac Efron actually realizes the character pretty well. He just isn’t a character who comes together. When the film is focused on the father-son strife between Henry and Dean, it’s quite messy. I still haven’t scratched the surface of all the relationships that develop over the course of the film. There’s the hard-nosed father-son stuff between Henry and his dad (played well enough by Goodbye, Solo star Red West). Henry butts heads with his biggest competitor, while Dean butts heads with that man’s son. Heather Graham—I still have no idea what she or her character were doing in this film—has relations with a few individuals. And ultimately, Henry needs to confront his past to deal with his present predicament with the investigators. Almost every relationship has its moments (except maybe the Heather Graham stuff), but there’s just too much. Throw in some obligatory comments about genetically modified farming (which Bahrani probably could have done more with) and you have a film and a filmmaker whose reach exceeds his grasp. Good review John. Probably one of the oddest movies I’ve seen this whole year, and I sort of mean that in a good way. It didn’t do much for me in the first hour-and-a-half, but with that final twist, really kicked my interest-meter up big time. Very surprising how it went, where, and why. Yes, the final 20-30 minutes are by far the film’s best material. Already complicated family dynamics kicked into overdrive.